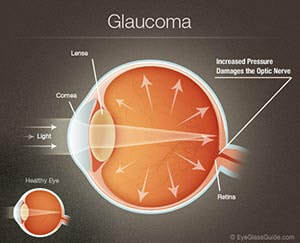 Glaucoma Statistics - Currently, glaucoma affects nearly 2.5 million Americans. And while anyone can develop glaucoma, the disease is most common in people over age 40, particularly African Americans. Glaucoma is five times more likely to affect African Americans than Caucasians, and roughly four times more likely to cause blindness. Visit the EyeGlass Guide today! What causes and what are some common types of glaucoma? Glaucoma cannot be cured, although through early detection and regular eye exams, glaucoma treatment can stop or slow the disease. Glaucoma treatment can include regular daily eye drops or pills, conventional or laser surgery, or a combination of treatments as recommended by an eyecare professional.